Bit of a slow week – the family was here for Thanksgiving, and I didn’t work much on the cab. Here are some pictures from last weekend. 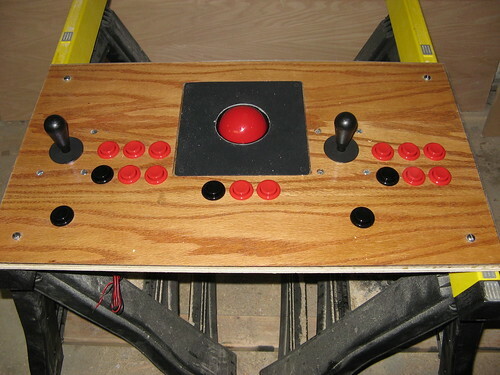 The woodwork is all but done now, and my next task is to wire the control panel. This is actually non-trivial, and I need the right tools for the job. 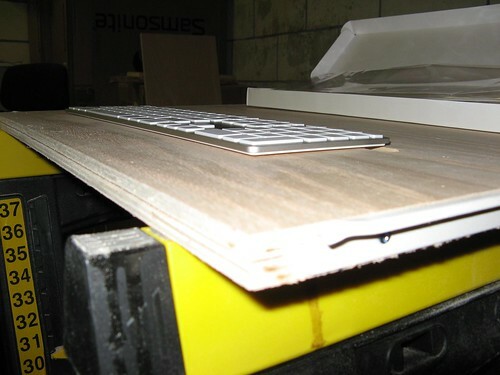 Having finished the CP, I turned my attention to the keyboard tray, and routed my planned groove for the super-slim Apple keyboard to make it insanely low profile. Here it is: designed by Apple, and Elbeno, in California. Today I tackled the control panel. I hadn’t done anything on paper; I just laid out the controls on the board I had cut. This turned out to be quite easy, although I had to pay attention to the mirrored-ness of the thing when I made cuts from the other side. 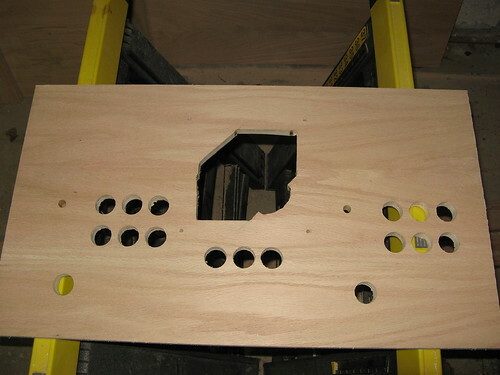 I started off by drilling some button holes (1-1/8″ spade bit) on the piece that I’ve codenamed “CPX” – the 3-1/2″ high piece that sits below the monitor bezel and directly above the CP. This is where I’m mounting the 1P and 2P start buttons, the Insert Coin button, and the Power button (which I’ll hook to the PC power switch). I had previously had mixed success using the spade bit with test drills, but I learned how to better do it: use a fresh battery in the drill, turn up the torque, and keep the bit at high speed. I found a high speed is the key to the bit effectively clearing chips, and when I didn’t have the speed high enough, I frequently had to stop and clear the chips. Also, don’t press down too hard. The oak ply I’m using is 11 layers thick, and drill progress tends to go in layers. On a good drill, I’d be through in 15-20 seconds. A slow drill would take a minute or two. I also learned from my first hole that (as I suspected, really) the underside was torn up a bit on breaking through. I wasn’t drilling against sacrificial wood, which would have helped that. A couple of times, the drill jammed as only half of the hole snapped away at the bottom and the remaining half was too thick to snap away, leaving me having to chisel the piece out from underneath. Here’s a shot of the CP with some initial button holes. I popped some buttons in as a test and to make the picture interesting. Here’s the same shot from the underside of the CP. You can see the exit wounds, and some of my layout design on the flip side. The trackball is huge: the ball itself is 3″ in diameter, and the mounting plate is 7-1/2″ square. 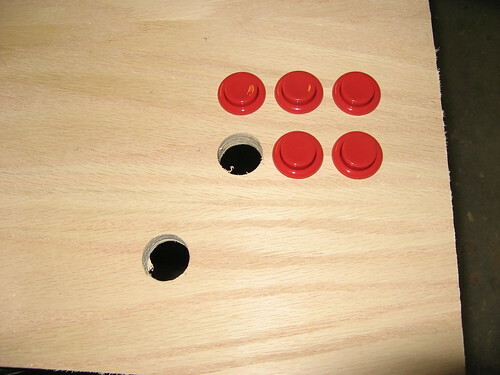 I routed and jigsawed the slot for it after drilling the button holes, and finally routed holes for the joysticks. 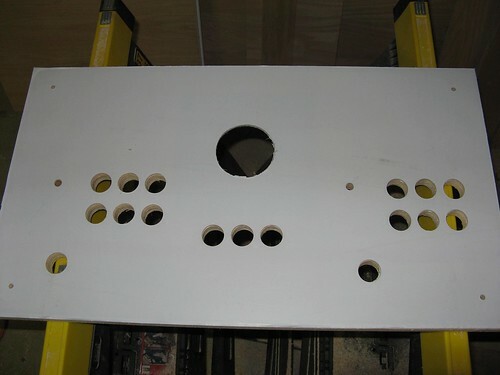 Here’s the completed (as far as holes) panel. After many weeks of what seems like slow progress, the project is now accelerating. Today I stood up the cabinet for the first time and cut all the remaining boards. I decided to stand the cabinet up with the boards I won’t need to stain and varnish, and I decided to do this step before varnishing the sides, although I still plan to stain and varnish everything else before assembly proper. As you can see, I also fitted the keyboard tray runners and the remaining ledgers for the control panel, monitor shelf, and bezel. 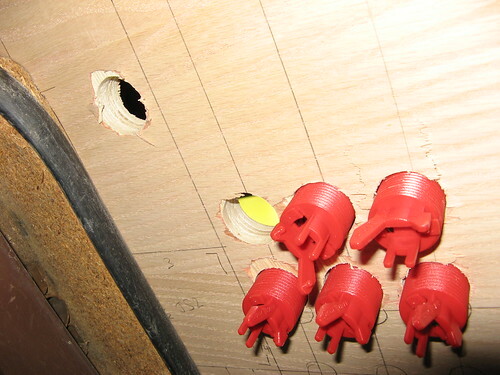 I slotted the base into the dado on one side and secured it with brackets and 1-1/4″ coarse thread drywall screws. Then I secured one side of the monitor shelf on its ledger. After this I was ready to put the other side on top and likewise secure it. This gave me a good framework although it was still wobbly in the sideways direction of course, so I mounted the back panel to give it some proper strength. The base, monitor shelf and back panel will all be out of sight in the final cabinet, so these were the parts I didn’t need to stain and varnish. I discovered that drywall screws are surprisingly hard to screw into (un-pre-drilled) oak plywood, but with a bit of brute force and the help of some clamps (clamps are my best friends in this project) I managed to get everything sorted. I also discovered that a circular saw baseplate angle of around 40 degrees is difficult to make a decent cut with, and that my initial top board was cut too long. That’s no problem though – I can always take more off! I also slot-cut the edges of the boards that I plan to expose in the final assembly. 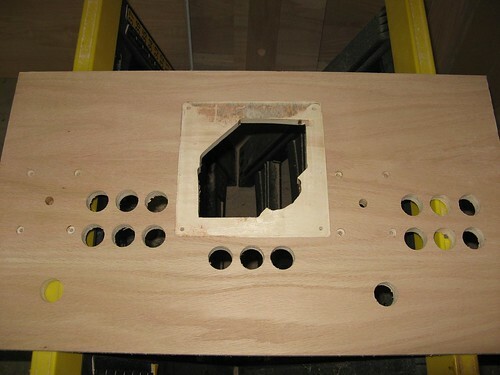 Next steps are to cut the control panel holes, the speaker holes, and the subwoofer hole. I have a coin door, but I’m thinking I’ll skip mounting that for now. 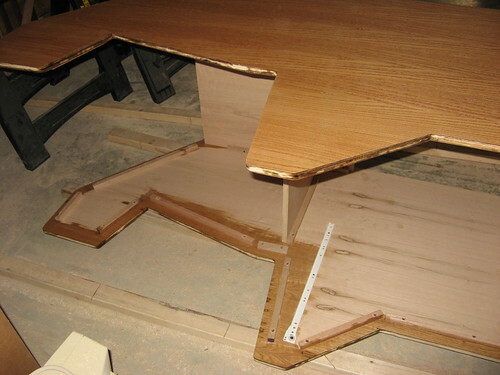 Once I have everything cut (hopefully tomorrow), I’ll be ready to stain the remaining wood (during the week if I can), varnish everything (next weekend), rig the control panel and assemble the cabinet just in time for Thanksgiving week when the in-laws arrive. Although I ordered the monitor last Saturday, it hasn’t arrived yet. I’ll probably get it early next week. So for the moment I’m holding back on the precise positioning of the monitor shelf. Today I did some staining with Danish Oil. Although Danish Oil is a complete finishing solution, I’m going to varnish on top because it will better disguise splintery parts, I think it will be harder-wearing, and it will be a better finish for applying decals, should I want to. 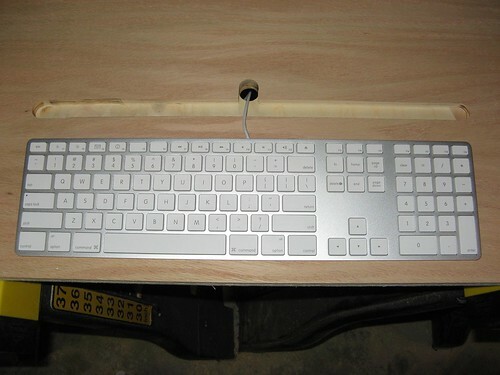 For the keyboard tray height problem, I’m going to fit the new ultra-slim apple keyboard. A friend at work has one; the whole thing is under 3/4″ high. Did a bit more today. 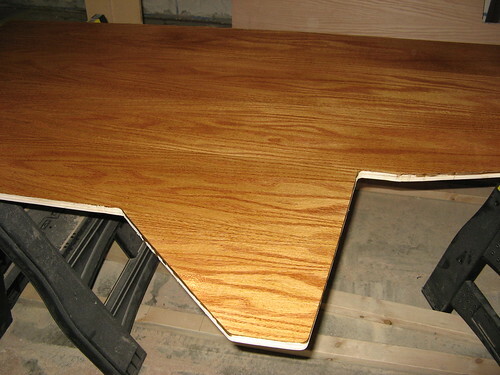 I clamped the sides together again and sanded the corners round, so that the t-molding will follow a nice contour. Then I pre-drilled the monitor ledgers. I haven’t actually positioned them yet because I just ordered the monitor yesterday: a Samsung 204B will be the display for this cabinet. I am pondering my keyboard tray arrangement: it seems like I don’t have a lot of room under the control panel to slide the keyboard. So I may have to make adjustments to figure that out. What I need is a very low profile keyboard, perhaps. I also cut some boards: the top, the speaker board, and the monitor shelf. Because I’m opting to make my cabinet 28″ wide for extra control panel space and a square footprint, I have to be a little careful about my choice of cuts. 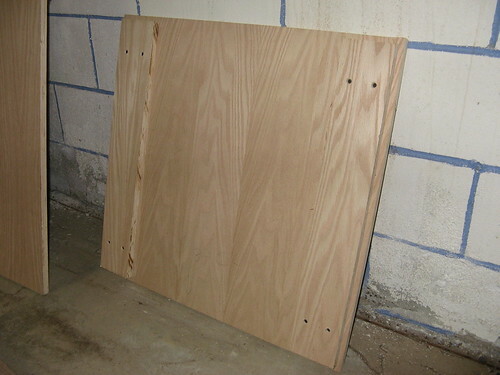 I only bought 3 4’x8′ sheets of oak ply, and two of them already had the sides cut from them. 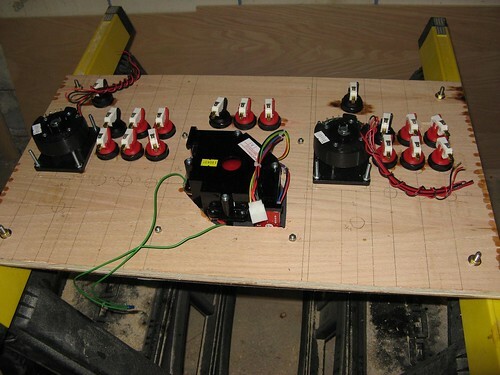 Allowing the two 3/4″ sides, the other boards are 26-1/2″ wide, which means (unlike a smaller width cabinet, say 2′) they don’t fit 2 side-by-side on a 48″ wide sheet. So I have a bit of a knapsack problem going on to make sure I can get the sizes I need from the remaining wood. But luckily it’s not too hard of a problem, because I only really have 3 “big” boards: the lower front, the back angle and the back. And the lower back of the cabinet will be open. 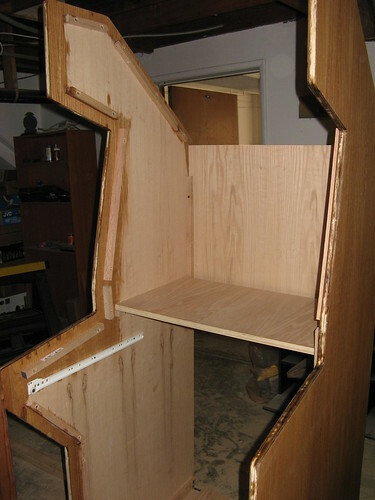 Next step is to stain and varnish the sides (which are now complete otherwise) and wait for the monitor to arrive. Today I got to work with the ledger boards which will support the monitor shelf and the various panels. To avoid external screw holes, I’m pre-drilling countersink holes on the ledgers from the inside. The first thing I did today was mark all the way around the side 1 1/4″ in from the edge. This would be my ledger edges, so that when the 3/4″ panels are mounted, I’ll have a 1/2″ inset all the way around. Then I cut the 3/4″ x 1 1/2″ stock down the middle to give me some 3/4″ square stock, which I used for the front base panel and angled panel ledgers. After drilling and mounting those, I took the other piece of 3/4″ x 1 1/2″ and marked it off in lengths for the rest of the ledger pieces, then jigsawed it up, and split each down the middle as before to give me a pair of ledgers for each panel (one for each side). The rest was more drilling and mounting, which I haven’t finished yet. 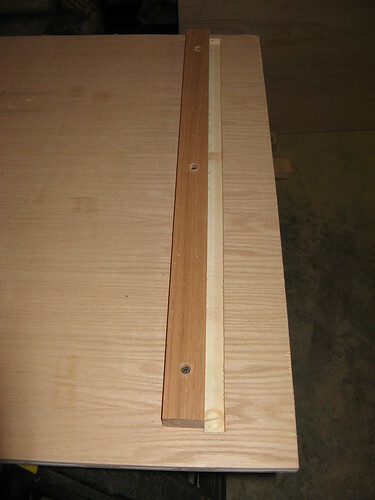 Then I cut and fit the ledger rails for the base, putting them above the slots. And here’s a picture of that. Today I did some more work on the cabinet. Little by little, it’s progressing. I figure the trick is just to keep at it. 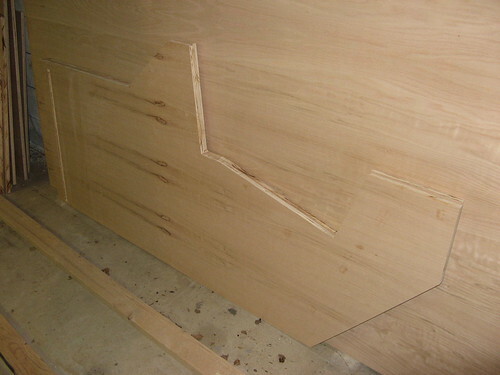 So I tackled the somewhat daunting task of routing a 3/4″ groove at the base of the sides to slot the cabinet base into. I had some trouble attaching the router bit – the shank didn’t seem to go very far into the collet. I tightened it up and hoped for the best. Then I set the depth to about 3/8″, checking it against the side of the ply, and marked a 3/4″ groove running 2-5/8″ above the base (allowing for the casters plus mounting). After clamping a straight edge to guide the router, I got going. Everything was going well until about halfway through the first groove. My doubts about the bit were right as it came out of the collet! That’ll teach me… sparks flew and I cut the power ASAP, then inspected the damage. Luckily, the bit hadn’t a) flown out and embedded itself in my femoral artery, or b) penetrated all the way through the ply (although it had gone a good deal deeper than I intended). I set it aside and inspected the router. Everything seemed OK. I loosened the collet nut and took a look inside. No pieces of shank in there – another good sign. A couple of test spins told me the motor was OK and nothing had gone obviously wrong. So a lucky escape. So I decided to investigate a bit further into why the bit wouldn’t go all the way in. I removed the metal piece that is tightened by the collet nut and grips the shank of the bit, and tried slotting various bits into it. Now it wasn’t accepting bits nearly as freely as it used to. There was no obvious reason why, other than that perhaps it’d become too tightly clamped and had permanently deformed a bit, or there was some abrasion inside that was roughing up the entry. Anyway, it wasn’t anything obvious I could see, so I fit the 3/4″ bit properly with the aid of two pairs of pliers, so at least I could be sure it was as safe as possible this time round. And with that, I went back to the routing. This time was much less eventful, and I successfully finished one side. I chiselled out the corner pieces of the slot to square it up, and repeated the process for side 2. The end result is that I’ve pretty much completed woodworking on the sides now. The next job is to make the base and start the assembly proper. 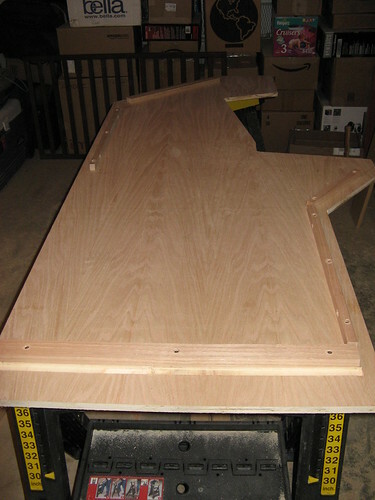 Here’s a shot showing the routed groove which the base board will slot into. You can also see (if you look carefully) the 1/16″ slot made by the slot cutting bit. I’m so glad that one didn’t fly out of the collet! And here’s the completed sides. 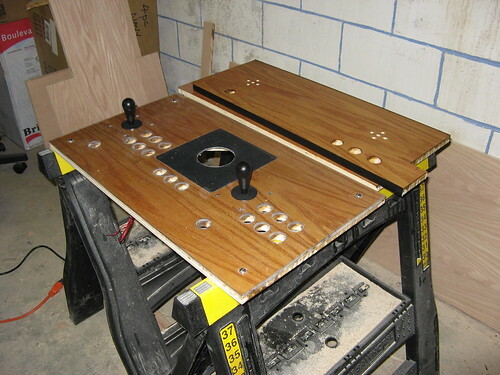 This morning I did a bit more work on the MAME cabinet. It’s coming along slowly. I now have both sides cut out (and they match each other!) 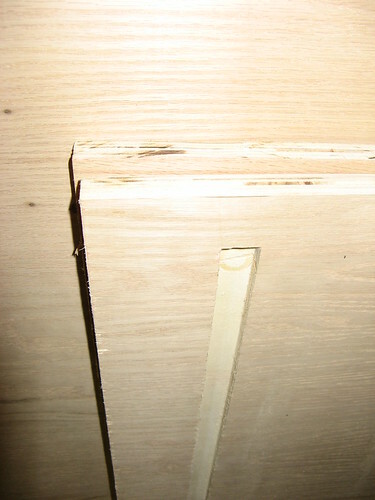 and the slots cut for the t-molding, which I received in the week. The slot cutter bit was too big to fit through my router’s base, so I had to pre-plunge and attach the bit with the router locked down. Luckily this worked. I also removed the vacuum attachment section for more space (I don’t have a vac to attach). Slot cutting was the part I was a bit nervous about, but in the end it turned out a lot easier than the other routing I’ve done. I’m sure this is partly because I’m getting a bit better at routing but mostly because the bit was nice and sharp and removing a small amount of wood compared to the flush trim bit. I did a test on some scrap ply and a sample piece of t-molding, and it turned out perfectly. The bit went through the ply like a hot knife through butter, and the whole process was over in a few minutes. I’ve also been working more on cataloguing my library, and also my games library. I’ve pretty much done the games – I have many fewer games than books, and they’re easier to look up on Amazon. All but a few have pictures, and knowing more about games, I am more able to pick the correct variant than I am with books. The books are slower going: fine for the more recent titles, but older editions tend to be a bit more iffy with regard to ISBN, and some don’t have ISBNs. But I’ve made more progress on the books tonight: I’ve done almost 4 bookcases now. 3 to go. As of current figures, I have 289 games and 795 books. You are currently browsing the archives for the MAME category.